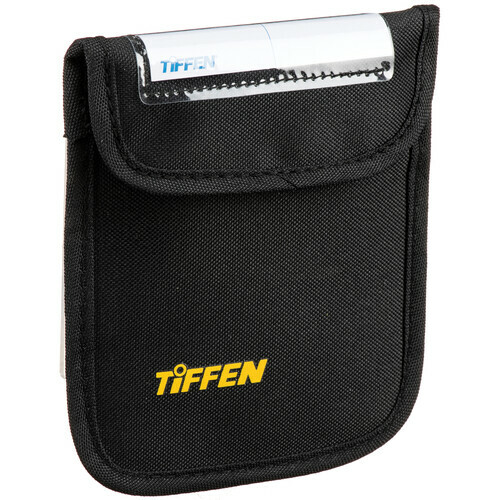 The Tiffen D Pouch (Black) is a heavily padded, water-resistant nylon pouch designed to hold a 4x5.65 and 6x4" filters. This is a replacement for the pouch originally supplied with the filters. Box Dimensions (LxWxH) 7.9 x 6.5 x 0.9"
D Pouch is rated 3.0 out of 5 by 1. Rated 3 out of 5 by Christine from Seems like a cheaper version from the original pouches. I have some older pouches from Tiffen that needed to be replaced and they seem much better than the these new ones. The new ones have much less padding and a 4x5.65 filter barely fits into it. It does fit but it is tight. Overall these pouches seem to offer reduced protection of the filter and your massive investment(s). For the price of these D pouches I really expected a better product. I recommend to others only if you really need it and you need to have the Tiffen logo on the pouch. Hi, I would like to know how many filters it can hold.thank you.Nuria. The Tiffen D Pouch is for a single filter.